Little ones will love touching and feeling farm animals in this novelty board book that's perfect for spring from bestselling author, Karen Katz! Karen Katz has written and illustrated more than fifty picture books and novelty books including the bestselling Where Is Babys Belly Button? After graduating from the Tyler School of Art in Philadelphia, she attended the Yale Graduate School of Art and Architecture where she became interested in folk art, Indian miniatures, Shaker art, and Mexican art. Her book, Counting Kisses, was named one of the 100 Greatest Books for Kids by Scholastic Parent & Child and was a Childrens Book-of-the-Month Club Main Selection. Karen, her husband Gary Richards, and their daughter Lena divide their time between New York City and Saugerties, New York. Learn more about Karen Katz at KarenKatz.com. 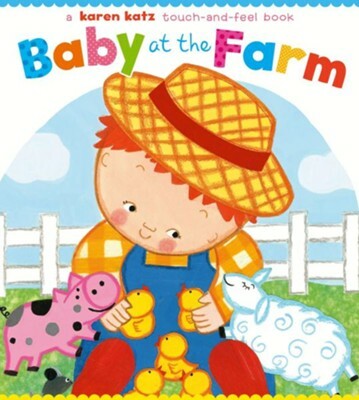 I'm the author/artist and I want to review Baby at the Farm: A Touch-and-Feel Book.